Music is an essential part of the Final Fantasy series. Players who have spent any amount of time with the franchise likely have a few overworld themes buried deep in their subconscious, and the series as a whole covers a wide variety of musical styles, ranging from catchy 8-bit tunes to fully orchestrated scores. Theatrhythm Final Fantasy premiered for the Nintendo 3DS in 2012, repurposing a handful of Final Fantasy soundtracks for a rhythm-driven experience with light RPG elements. The result was both a nostalgia trip and a solid game in its own right, supplementing its pedigree with inventive beat-matching gameplay that made satisfying use of the 3DS touch screen. 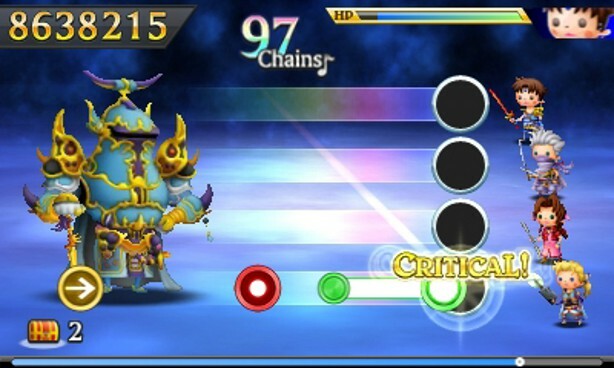 Sequel Theatrhythm Final Fantasy: Curtain Call easily surpasses its predecessor, tripling the original game's track list while polishing its gameplay to a mirror sheen. It's a loving, reverent tribute to a beloved series that skillfully recontextualizes one of its standout features, creating something worthwhile both for its fanbase and for newcomers. In terms of its mechanics, Final Fantasy Curtain Call plays identically to its predecessor. Players tap and swipe the touch screen in response to on-screen prompts tied to backing music tracks. These cues require the player to tap, hold, or swipe the touch screen in a given direction; while the game's lowest difficulty level delivers cues to a consistent rhythm, higher difficulty levels often tie their prompts to melodies or backing motifs, rewarding players who are already familiar with the source material. Missing cues deals damage to your RPG party members, who explore linear paths and battle monsters in the background during gameplay. 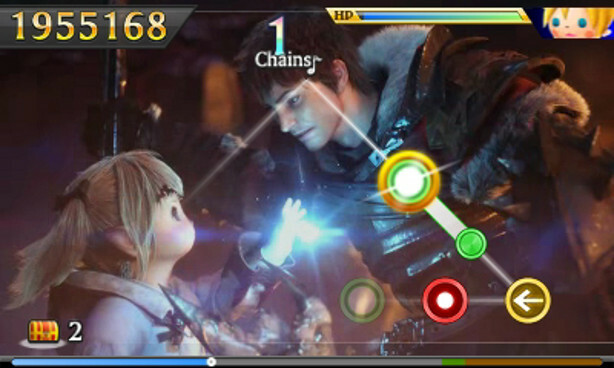 Players can assemble their party using dozens of unlockable heroes plucked from past Final Fantasy games, each of whom learn spells and abilities that help out in battle. Novices who expect to take a lot of damage will want to micromanage their party members and inventory before each stage, adding an element of strategy. One of the original Theatrhythm's flaws was that advanced players could ignore its RPG elements almost entirely while playing individual tracks; if you miss only a few notes per stage, your party will survive regardless of how much customization you've put in beforehand. Curtain Call's new Quest Medleys force veterans to consider their party makeup before each battle. When accepting a Quest, players embark on a multi-stage branching journey that ends with a difficult boss encounter, forcing you to ration your items and outfit your party carefully before accepting new challenges. Quest Medleys also make Curtain Call better-suited for portable play than its predecessor. Short, Medium, and Long Quests are included, letting you choose an appropriate length and end point for a single sitting. Curtain Call is considerate of your free time; players who only have a few minutes to kill may want to play through a few individual tracks in Music Stages mode, while players settling in for an hours-long session can dig deep into Quest Medleys. Curtain Call also introduces a new control scheme that uses the Circle Pad and buttons in lieu of traditional stylus input. While it's not perfect, the new control scheme is a great alternative for situations where stylus input isn't practical – a bumpy bus ride, for instance. Button input also makes some stages a lot easier than they would be with stylus input. I generally preferred switching to Button controls during battle sequences, which focus on quick taps and directional slashes. Button Mode falters in the Field scenes, however; the touch-and-drag "hold" sections require a degree of analog accuracy that the Circle Pad just can't replicate. Overall, the stylus option feels more satisfying across all game modes, and Theatrhythm's audiovisual feedback is better suited to swipes and taps than it is to button presses. Still, the new control scheme is a capable alternative, and makes the package more accessible. Multiplayer is another new addition in Curtain Call, but it's less of a revelation than Quest Medleys are. Players take on others in local or online head-to-head matches across individual Battle Mode tracks, with successful combos triggering rotating notes, random scroll speeds, and other concentration-breaking effects on the opponent's screen. It's a decent enough distraction, but you probably won't spend much time with it. If you'd rather not deal with online matchmaking (watch out for level 99 players), you can square off against AI-controlled enemies in a slow-paced multiplayer campaign. The single-player mode has more than enough content to keep you occupied, as Curtain Call boasts more than 200 playable tracks across all main-series Final Fantasy games and beyond. You may be surprised to see a collection of tracks from spin-offs like Dissidia and Crisis Core, along with surprise showings from the largely forgotten SNES spinoff Mystic Quest and the Final Fantasy 7 CG film adaptation Advent Children. Curtain Call's track list also features a lot less filler than its predecessor. The original Theatrhythm's structure included several prelude and outro segments that quickly became monotonous. Curtain Call trades in its predecessor's lesser moments for a greater number of challenging tracks, eliminating the preludes altogether and scaling back the original Theatrhythm's focus on plodding FMV-backed "event" scenes. The result is a more varied and enjoyable track list, with a lot less downtime in between songs. As a returning Theatrhythm player, I greatly appreciated Curtain Call's revised gameplay structure. The original Theatrhythm forced players to complete entire setlists of songs on their easiest setting before unlocking higher difficulties. Curtain Call grants access to all difficulty levels for all 200+ included songs from the get-go, letting rhythm genre veterans choose their own pace and degree of challenge without having to trudge through hours of training beforehand. If you didn't enjoy the gameplay in the original Theatrhythm, Curtain Call won't do much to win you over. The same gameplay remains at the core of the experience, and the sequel's additions only serve to augment the original's framework rather than overhaul it. Otherwise, Theatrhythm Final Fantasy: Curtain Call outclasses its predecessor to such an extreme degree that it makes the original Theatrhythm obsolete. It's a solid purchase for Final Fantasy fans and rhythm game veterans alike, and it explores the Theatrhythm concept to its fullest. This review is based on a pre-release eShop download of Theatrhythm Final Fantasy: Curtain Call, provided by Square Enix. Images: Square Enix.